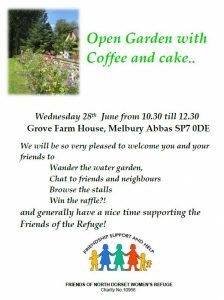 Open Garden 2017 Come and enjoy a morning in a beautiful garden while helping the Friends of North Dorset Women’s Refuge to keep up their support of families who have had to escape from Domestic Abuse. What’s domestic abuse you ask? Think of recent Archer’s stories and Broadchurch and you’ll know. Come to Grove Farm House, Melbury Abbas SP7 0DE on Wednesday 28th June from 10.30 till 12.00 and enjoy a wander, meeting others, perhaps winning the raffle. Our coffee is excellent as are our home made cakes so please come and enjoy the morning. Sorry, we can’t cope with dogs – lack of shade in the car parking area.